It's a real-time tactics game that follows a fictionalised account of the actions of the real British Commandos (Wikipedia link) during World War 2! 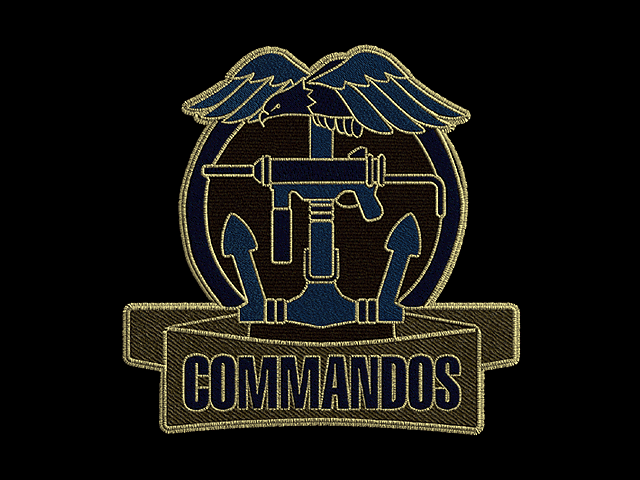 I've been told that Commandos is really hard so I'm going to play the tutorial first. Click the pictures to see PNGs. 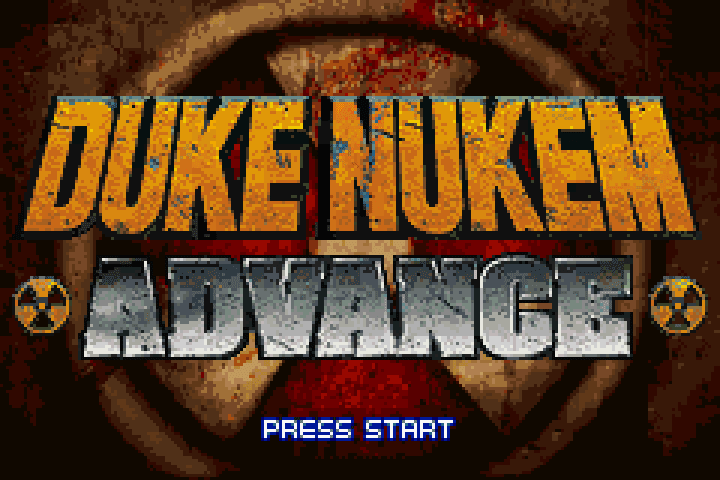 Today I'm taking a quick look at Duke Nukem.... Advance. I didn't even know there was a Duke Nukem game on the Game Boy Advance until recently, which isn't usually a good sign. Not that I could even name more than like 20 GBA games (and that's using this site's game list to cheat). I imagine it's either going to be a platformer like the first two games, or an isometric shooter like Max Payne Advance. Anything but a straight port of Duke Nukem 3D works for me, because I've written enough on the game already. Though I'd be impressed if they managed to get that running on a GBA. This game was a request. Well actually they requested that I take their copy of the game for free and get it out of their sight. So, yeah I've got high hopes for this one. 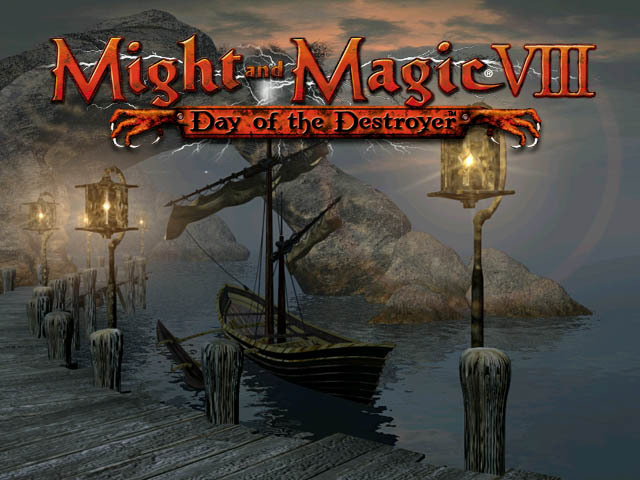 Ocean played Might and Magic VI for the site last year, but this is the first game is the series I've actually played myself. All I know about the game is it's going to be a fantasy RPG, and it'll probably be in first person. I'm using the unofficial GrayFace patch just to get the game to run at all on my modern day OS, so things may not be entirely true to the official version. Ganbare Goemon! Karakuri Dōchū Aka. Mystical Ninja. 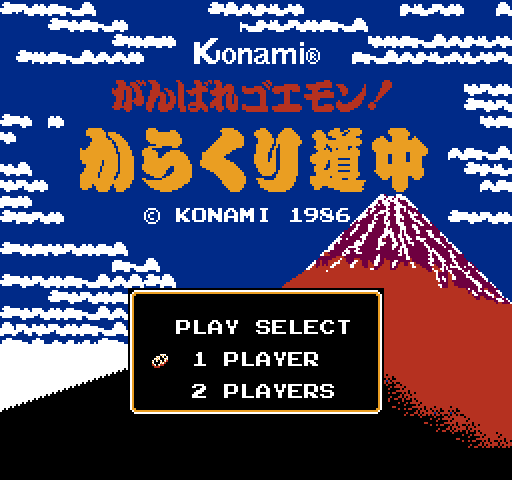 This is the second of the Goemon games, and the first to be released on home consoles. Or so wikipedia claims. This title screen hangs around for exactly three seconds before the game goes into demo mode, and I can certainly understand why they wouldn't want players to get a good look at it. 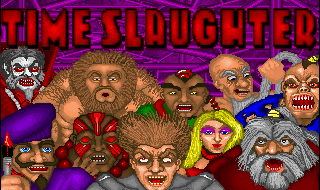 It wouldn't be a finalist in a 'greatest NES title screens' tournament for sure. This is my 100th post on Super Adventures in Gaming! For a nice change, I'll play a first person shooter that everybody's heard of so you can all laugh at me as I fall down holes and miss the obvious! Cheer up. I've hit my Parklife gag limit already and we're still in the intro. Click the pictures to view them as clean PNGs! 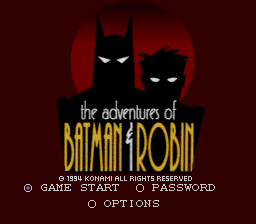 Today I'm taking a look at the SNES version of The Adventures of Batman & Robin, because someone asked me nicely. It's got the correct logo from the animated series, and it's playing the theme tune. So far so good. It's nice to see a password option too, though 'load game' would have been better. 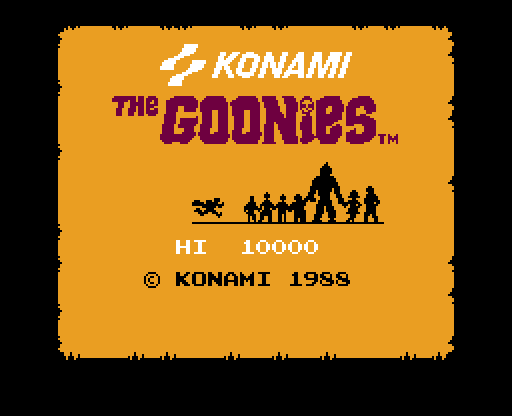 Today I'm playing Konami's adaptation of the Goonies, on the NES. I have to admit, I've never seen the movie this is based on. All I know about the film is that it's got a pirate ship in it, and is a bit like Indiana Jones, except with teenagers. Or maybe it's not, I dunno. 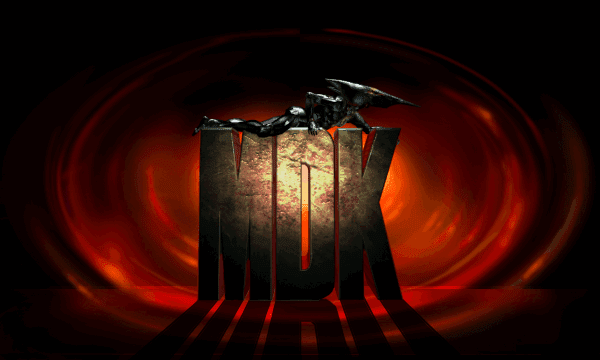 As requested, today I'm looking at MDK, created by the same blokes that brought you games like Earthworm Jim, Aladdin, another Earthworm Jim, and Cool Spot. Though not in that order. There's been a few explanations for what M.D.K. stands for. "Mission: Deliver Kindness" (in the manual), "Max, Dr. Hawkins, Kurt" (the main characters' initials), "My Dear Knight" (on the back of the Japanese box), or "whatever we say it stands for on any given day". Though everyone knows it's actually supposed to be 'Murder Death Kill', like in the movie Demolition Man. Probably. This one's another request, Buck Rogers on the Mega Drive/Genesis. 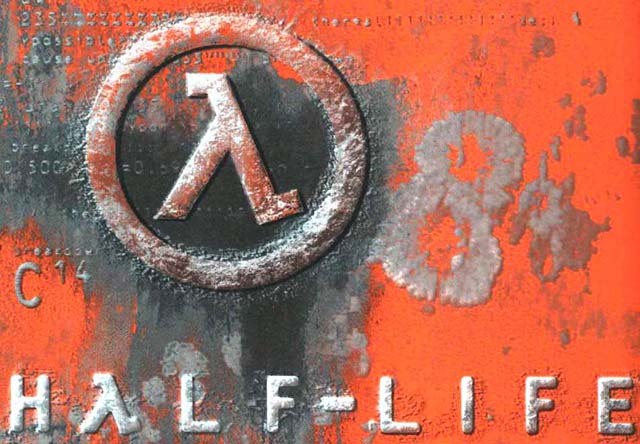 Or maybe they asked me to play the DOS version, I forget... either way this version's what they're getting. 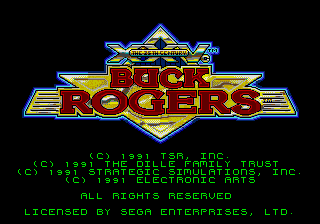 In fact a few people have asked me to play this, which surprises me because I've barely even heard of the game..
All my knowledge of Buck Rogers comes from watching the intro to the 80s TV series on youtube, so I probably won't know anything about anything. The game's made by SSI though so I'm fairly sure it's going to be an RPG at least. Well, here we are. I tried to prepare myself for this with colourful games but that didn't exactly work. As unanimously requested by the mecha-neko fan club, here's Millennium 2.2. Hope you like words! This is among the most depressing title screens ever created. The Earth fades to a dull grey/brown while a truly miserable main theme (YouTube link) plays in the background. The picture of the slime monster isn't bad at all, but that colour cycling effect and the blocky text looks really amateurish. Not a good sign. Uh, this one was a request. I don't know much about it, except that it's a fighting game, and I'm guessing it ain't by Capcom. WARNING, the following screenshots contain horrific scenes of extreme gore and bad art that some readers may consider to be 'a bit gross'. 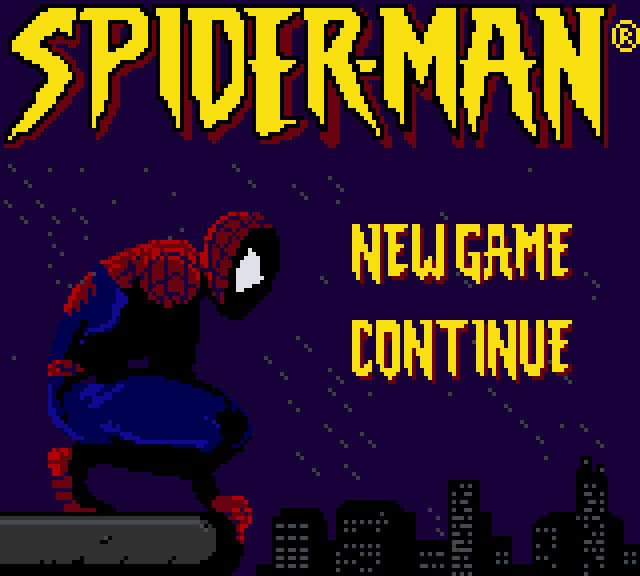 Today I'm taking a look at Spider-Man on the Game Boy Colour, because if there's one thing this site needs it's more platformers based on comic books. This may look like your average 'hero poses above the city on a rooftop' title screen, but it actually has a bit of story leading up to it.